Natural gas supporter and Republican candidate for Pennsylvania governor Scott Wagner (above, second from right) was a special guest on Energy Night at PNC Field on June 21, where he joined natural gas partners like (from left) Bill desRosiers of Cabot Oil & Gas, Jay Cleveland of Cleveland Brothers and Mike Atchie of Williams Midstream for a ball game on a beautiful summer night. 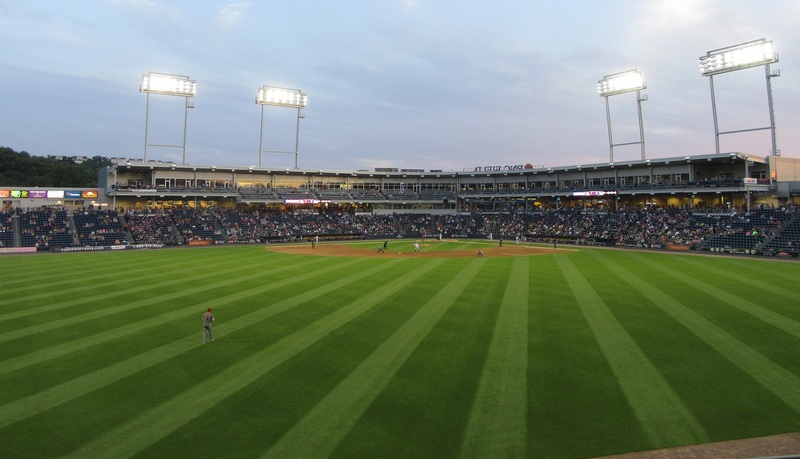 The audience for the June 21 minor league baseball game between the Wilkes-Barre Scranton Railriders and the Lehigh Valley IronPigs at PNC Field in Moosic included 960 employees, family members and friends of partners in the natural gas industry. Energy Night coincided with the summer solstice, and fans were treated to a spectacular sunset as well as a 3 to 1 victory by the home team. 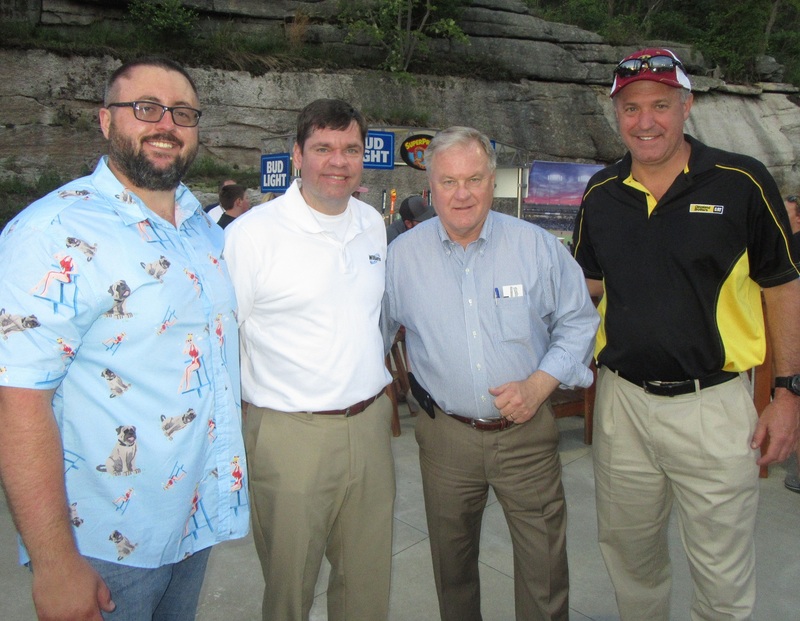 The event was coordinated for a fourth year by Cabot Oil & Gas. Energy Night guests had the outfield area, also known as the Homer Zone, to themselves. 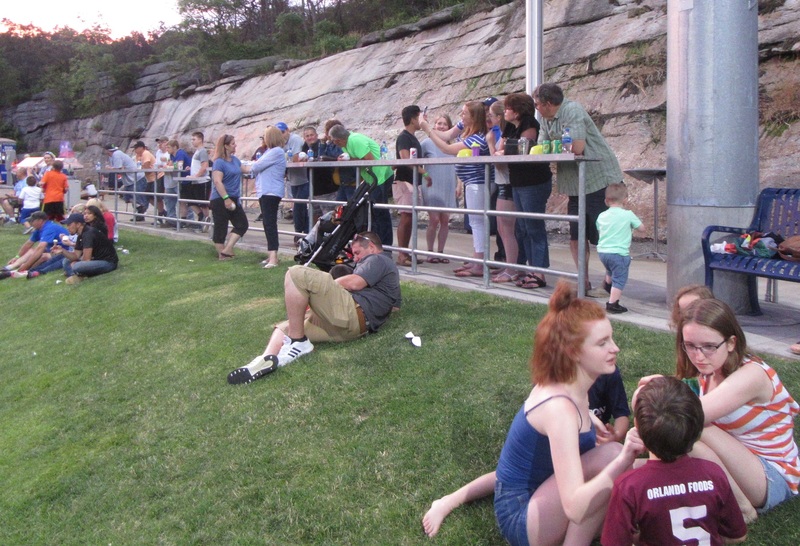 In previous years, they have taken over one of the pavilions, Cabot external affairs coordinator noted, but the number of tickets sold required a last-minute change of plans. Free food and beverages, as well as number of games were provided as part of the package. There were about two dozen guests representing Borton-Lawson, and engineering firm that has partnered with Cabot since 2011, providing templates for well pad layouts, and electrical and structural plans that can be moved from one site to another. The company also works with Cabot in Texas. “They’ve been very loyal to us, and we work very hard for them,” Borton-Lawson oil and gas section leader Chris McCue said of the relationship with Cabot. The ball game provided a unique recreational opportunity for his employees. “They can kind of see the bigger picture of all the people that bring it together,” McCue offered. “They are our main artery. We do A to Z for them,” RLE Enterprizes owner John Gentile said of Cabot. With offices in Moscow and Springville, RLE has provided snowplowing services, pad building and reclamation, rig moves, and road work for Cabot since 2009. The contracts comprise 60 percent of RLE’s workload, Gentile related. Energy Night was the perfect way the half dozen employees that he brought him to relax at the end of the day with others that they see in the field everyday. Additional energy partners at the ball park that night included Lackawanna College School of Petroleum & Natural Gas, InvEnergy, SWN, Williams, Diaz Companies, Energy Citizens, Holcombe Energy Resource, Rain for Rent, Falcon EFS Flowback, Corning Natural Gas, Tioga Environmental Consulting, Kenworth of Pennsylvania, and Anchor USA.